Tilicho lake trek is known for the world’s highest lake located in Manang District of Nepal in the Annapurna range at an altitude of 4919m. Among the different trek to Annapurna regions, Tilicho Lake trek is also famous for its religious point of view as many Hindu pilgrims from around the world visit this lake. The trek is undoubtedly providing some majestic panoramic view, great variety of culture and diversity, finest deep valleys and high mountains encircling the giant Annapurna Himal. The place is rich with the wide range of people and terrain, sub-tropical to high, dry landscape resembling the Tibetan Plateau. The trail leads you to the fine village inhabited by a wide diversity of people from different ethnic groups. Tilicho Lake Trek starts right from Besisahar to famous Annapurna circuit route, which goes along the Marsyangdi River valley, with great views of Manaslu and Himal Chuli to the east. every day we will see the different landscapes as the trail start from subtropical climate and end at the snow line. For the lovers of nature it a magnificent and real opportunity to see a lake at this altitude and also it is famous for the religious point of view. After visiting the lake the trail goes to Yak Kharka and joins the normal route crossing the Thorong La Pass (5416m). 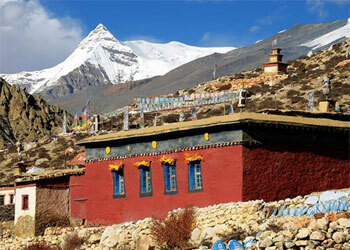 We will also visit Muktinath via Plateau of Kagbeni and return to Jomsom. On the way, we will pass through every type of vegetation zone from lush sub-tropical to harsh semi-desert and the highest trekking passes in the world. Tilicho a high altitude lake trek will keep you regaling your experiences for years to come. Take on the challenge of this difficult trek and the rewards will be immeasurable and a true once in a lifetime experience. Tilicho lake will be a perfect destination for those who aspire to venture into some of the less trodden remote regions of Nepal apart from the regular trekking routes. Trip Snippets: 18 days, 4 night’s hotels, 13 nights lodges, Breakfast in Kathmandu and Pokahra, 3 meals a day ( breakfast, lunch and dinner during the trek) are included. Departure Dates: We are able to offer this trek on any dates during the months Feb, March, April, May, June, Sept, Oct, November and December for a group of 1 to 15 people. Your trek Backpack/duffle bag: Your baggage on the trek will be carried by our porters, the maximum weight per trekkers is 15 kg including your sleeping bag and down jacket, Other items not required on trek can be stored in our office or your hotel in Kathmandu or Pokhara. A very warm ‘Namaste’ (welcome in Nepali) for your great journey with us. We will meet at the Kathmandu, Tribhuvan International Airport and would drive to your hotel. As you get ease and freshen up after your long fight, we humbly request you to visit our office for a briefing about your program. You will have a meeting with your trekking guide and discuss the equipment needed for the trekking and we will process for the trekking permits. If you arrive at night we will have the same discussion in next day morning after your breakfast. The next morning after breakfast you will leave for a full day sightseeing tour around the Kathmandu valley. You can pay your homage visiting the center of pilgrimage Pashupatinath Temple (for Hindus) and Swyambhunath (for Buddhists). These are very ancient and historical pride of Nepal importantly enlisted in UNESCO World Heritage sites. The biggest Buddhist Stupa at Boudhanath and the fine arts and historical architecture of Kathmandu Durbar Square reflect the uniqueness and diversity in Nepalese culture. On the journey back to the hotel, you can travel around the local areas, gullies and lifestyle. You can perhaps take a relaxed walk through the famous streets like Thamel. Take a vehicle or tourist bus to Besi Sahar through Prithvi Highway, about 6 hours drive. Reach Besi Sahar or Bhulbule at Lunchtime. Take a local jeep to Syange (1080m) driving with the view of River, greeneries, local villages and beautiful mountain scenery. A steep and slippery trail runs up and down through paddy fields, passing through tiny Tibetan villages, the trail ascends through the rhododendron forest to Jagat (1330m). If our drive is late, we can stay in Syange as well. The trail continues zigzag way across the right side Marsyangdi river view and after crossing again suspension bridge in the Marsyangdi River the trail goes uphill and gradually steep flat and get to Tal. Tal is one of the famous places for valley views and waterfalls. We enter Manang district, the trail continues through barley, rice, potato fields and pine forests past the village of Khotro (1860m). Descend to a forest to a long suspension bridge and very pleasant courtyards of Alpine. Passing through Karte and Nache village, the new trail continues a stone Kani making a formal entrance to Dharapani. Dharapani is one junction way for Manaslu round and also big villages in the Manang valley. After registering in the ACAP office, gradually climbs over a spur. Walk to Bagarchhap (2160m) through a forest of blue pine, spruce, hemlock, maple, and oak. The trail stays on the south bank of the river, climbing through forests to Danaque (2210m), a valley surrounded by apple orchards. Climb steeply crisscrossing section of the road through rhododendron forest. The trail climbs along the mule track through in and fir forest and then follows the river for a time amongst the higher oak and maple trees. At the entrance to Chame is a long wall with many prayer wheels; the administrative headquarter of the Manang district. There are fine views of Lamjung, Annapurna II/IV (7525m). Stay overnight at guest house. Climb past Mani walls to a field of buckwheat in tiny village Telekhu (2840m). There are a long, peasant and mostly level walk in forests with some dramatic scenery as you walk through a deep gorge. The pine-scented trail rounds a bend to reveal the first views of dramatic Paungda Danda rock face, a tremendous curve slab of rock. 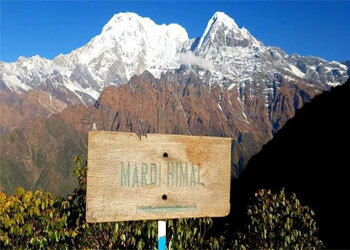 Over a ridge marked by prayer flags and stone cairn, continue the steep ascent to the upper Marsyangdi. The trail follows through the river valley with good views along the way of Pisang peak and Annapurna II at Pisang. Pisang marks the beginning of the region upper portion of the Manang district. It’s about 6-7 hours trail. From upper Pisang, the high trail enters pine grooves to reveal views of the small turquoise lake. The trail does a dogleg through the charming village, passing with views of painted Mandalas and dragon mouth spouts. Hike through the fields of grazing yak and a wide variety of crops. The trail climbs a steep ridge right side of the Marsyangdi River to get Ngawal (3660m) but it is one of the really great viewing points of the whole Annapurna Ridge and the Marsyangdi river valley view. On the way, we pass pine forests, villages such as Braga and farming terraces. The large Tibetan settlement Manang provides good views of Annapurna II/III/IV, Gangapurna and Tarkekang. Stay at 3570m. This day you spend the second night in the Manang region to acclimatize to the higher elevations you will encounter towards the Thoroung La. Take advice from Himalayan Rescue Association and observe the spectacular views of the Himalaya nearby. There are fine views of the milky blue glacier lake at the foot of spectacular Gangapurna icefall and traditional stone buildings. You can explore Khangsur Village, Kecho Lake or Milarepa Cave. Stay overnight in camp. Descending from old Manang and passing by Chorten reach a Marsyangdi river, cross a suspension bridge over Jharsing Khola (stream It is possible to cross the ridge north of Annapurna IV, II, and Glacier Dome or to descend from village to the glacial lake at the foot of a huge icefall descending from the northern slopes of Gangapurna.the trail stays close to the river bed and soon we approach Khangsar, superb view of the Great Barrier open up. There you find a small monastery, Chorten, Mani walls and prayer flags. Stay overnight at camp in Khangsar. Stay overnight at camp in Khangsar. From Khangsar the trail climbs steeply past the Gompa and small chortens, the trail goes through juniper and sea buckthorn bushes. The path is quite covered by small crystals and shrubs can be seen on both sides. Some places along the trail you cross a few streams. You reach a crest (4650m) with prayer flags after the wearying climb and then through a series of zigzags down a scree slope bring you to the Tilicho Base Camp Hotel. From here you can enjoy the closer and panoramic views of Tilicho Mountain and many others. Tilicho Lake is situated at the highest altitude so we set our camp today here at low. The trail to the Tilicho Starts up a side valley then traverses onto a moraine, making a long climb to 4710m. 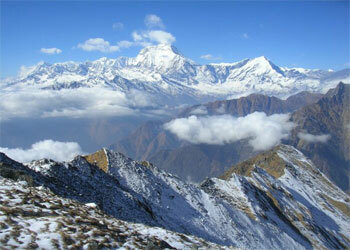 There is an outstanding view of Tarkeghyang, Gangapurna and the Khangsar Kang. Tilicho Lake, the highest lake in the world at (4920m), presents a particularly dramatic spectacle. Sometimes its turquoise water reflects the surrounding peaks but more often its frozen solid. After spending the memorable time at Tilicho Lake, we will trek down to Tilicho base camp via the same way for an overnight stay. The trail continues to climb out of the Marsyangdi Valley. The trail follows this valley north, passing a Goths as it steadily gains elevation. You have left the large trees below; the vegetation now consists of scrub juniper and alpine grasses. you can keep high and follow a track 400meters or so above Khangsar village passing through the ruins of old Khangsar and follow an unmarked trail which will lead you around and down to cross the river on an old log bridge between Gunsang and Yak Kharka. It’s fun to see large yaks grazing at Yak Kharka. The view of Annapurna III is excellent. From Yak Kharka, the trail climbs along the east bank of the Jarsang Khola, then descends and crosses the stream on a wooden bridge at 4310m. Blue sheep, and even snow-capped leopards, sometimes magically appear. The crow-like bird choughs, large lammergeiers, and Himalayan griffons circles you overhead. It is sometimes possible to see herds of blue mountain sheep at Phedi. Overnight at Phedi 4400m. The trail becomes steep immediately after leaving Thorung Phedi, switchbacking up moraines and following rocky ridges as it ascends to the Thorung La pass (5416m). You can see the long Great Barrier ridge, Tibet like region of Manang, as well as the Annapurna, Gangapurna and the heavily glaciated peak of Khatung Kang (6484m). The trail descends crossing meadows steeply down to Muktinath. One of the most important pilgrimage sites for both Hindus and Buddhists. It is also home to many ethnics Tibetans and holy Buddhists. From Muktinath to Jomsom, we see people from Mustang who comes to sell handicrafts to pilgrims. Among them, merchandise is the highly revered mollusk fossil called Shaligram. We will pass some ancient caves and view the impressive white snow-capped mountains. The trail stroll among meadows, streams, poplar and fruit trees, finally we arrive Kagbeni a gateway to Upper Mustang; it has to pose Chortens and ochre-colored Gompa and monastery. After lunch in Kagbeni continues trekking to Jomsom on the windy trail of Kali Gandaki valley, overnight at Jomsom. An early morning we will take a short picturesque flight to Pokhara. The view of Annapurna and Dhaulagiri mountains and world’s deepest gorge, Kali Gandaki is stunning. Relax whole day in Hotel or wander around Lake Side with fascinating mountains panorama view and nature charming. Explore the various interesting places like Mahendra Cave, David’s fall and the various lakes of course. 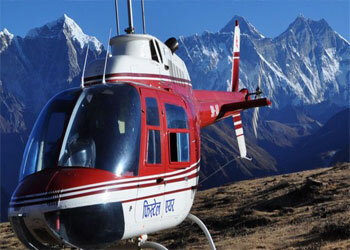 Day 17: - Pokhara to Kathmandu, Take a 25 minutes flight or 6/7 hour Drive. Take a flight or drive by tourist bus/Private car to Kathmandu. In the evening you can have your last night in Nepal enjoying the Nepali cultural dinner show, taking some beautiful snaps and making up your mind about the returning journey. You can have greetings exchanging among friends and with all Nepalese people. We will take you to the International Airport for your convenience. Wish you a happy journey in the traditional and cultural way of us Nepalese and Good-Bye with a hope to see you again. Above the Himalaya Trekking have made every effort to keep our price as competitive as possible, by still providing an excelling service to our customer. We pay our porters and guide the legal wages agreed with the porters union, our trekking staffs are some of the best paid in Nepal which allow us to attract only the best guides and porters and we have the same amount of Insurance for guide and porter which is more than Government fixed amount. All our price are net and there is no hidden cost everything is clear on cost includes and excludes this is the main reason all our customer are happy with our service. For up to date cost for the trip please contact us. Government license holder experienced, trekking guide (trained in Wilderness First Aid& altitude sickness) and porters (1 porter for between 2 trekkers basis) with their food, accommodation, salary, equipment, and accidental insurance, clothing, and medicine. Daily Meals are chosen from the Menu (breakfast, lunch, and dinner) during the trek. Nepal entry visa fee, you can get Nepal visa upon arrival at the Airport. International Airfare/Airport tax, Kathmandu City tour Sightseeing entry fees. Alcoholic, hot and cold drinks, hot shower, Mineral/ hot water, Desserts. Any others expenses which are not mentioned in Price Includes section.